Today all of the masters players took to the tables for the start of the knockouts, with a place in the last 16 at stake. My opponent Kevin McMahon from Ireland is a quality player and was making his debut at the event this year. Despite losing the first frame, I slogged out a 3-1 victory, and really enjoyed the match. Although I have an injured left hand, for the first time today I began to see the angles better and was happy with my long game. It's now into the last 16 tomorrow, where I play another Irish Player, Frank Sarsfield over the best of 7 frames. As with all of the Irish players, Kevin has a very sound game overall and doesn't look out of place playing in a major European event, I am positive it won't be his last. In the hotel lobby last night I had the pleasure to discuss some of the finer points of our game with top referee Dmitry Savenkov from Ukraine, who refereed my final group game. 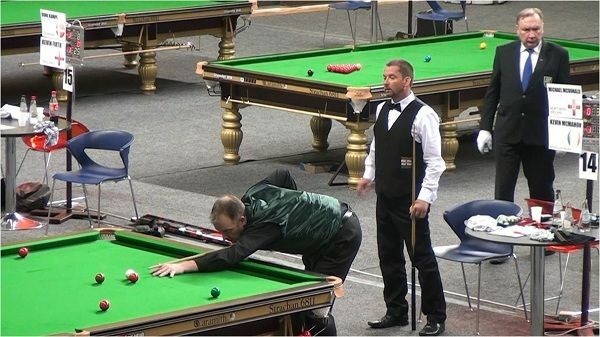 Dmitry has a clear love of snooker, and has a very commanding presence at the table, which all referees need. Amongst other topics, we discussed the miss-rule or the interpretation of the rule deployed by some (not all) referees. Such was the debate I have decided to create a new blog post on the miss-rule, outlining my own personal thoughts. Watch this space.